Korean VISA Guide: How my wife and I got Multiple Entry for 3 years. Good news for BDO and BPI Credit Card holders! The Credit Card promotion is extended up to December, 2019! So BPI and BDO both has promo for the multiple entry visa eligibility in S. Korea! You can check it here in the Korean Embassy’s announcement section. For BPI card holders, this promo is only valid to primary card holders – supplementary card holders are not included. For BDO, primary and supplementary card holders are included. After months of preparation, finally, we got our South Korean Visas! And it’s not just for Single Entry but Multiple Entry for 3 years! Let me help you how we did it by sharing our strategy, how we prepared and lots of tips! 😉 Read on! My Multiple entry Korean VISA! For travel guides to South Korea, Check out our 2015 6D5N S. Korea Itinerary and Expenses here! and our 2016 7D6N Winter trip here! Looking for budget friendly accommodations in Korea? Check out my review of Zaza Backpackers Hostel here and Hotel Maui here! For more recommended accommodations, click here or search for more hotels/hostels here. Me – Employee and has not been issued a S. Korean VISA before. Wife – Housewife and has not been issued a S. Korean VISA before. Frequent travelers who have traveled as tourist to OECD member countries within 5 years are exempt from submitting ITR. TIP: If you are not a Filipino Employee or a Housewife, you can also go through this link of the official site of the Korean Embassy in the Philippines for more information. So what was our difference with the other applicants? Why we were given Multiple Entry VISAs? Last June 2015, when I was checking the Korean Embassy’s site, I found out in the VISA Announcement section that BDO Gold and Elite Credit Card holders are eligible for Multiple Entry VISAs! I only have a BDO Classic card that time so I immediately called BDO if it is possible to upgrade my BDO Classic card to at least a Gold credit card. That’s the benefit of research and being a segurista 🙂 Please note that this offer is valid only until December 31, 2015! With that being said, let’s label this as Requirement # 11 – BDO Gold Visa Card so I can explain further some details regarding this requirement. TIP: Please note that a Single Entry VISA is only valid for 3 months! So before you apply for a VISA, make sure your travel dates to Korea are within 3 months after the VISA’s date of issue. I advise that you apply a month before your travel date. TIP: Arrive early! At least 30 minutes before. Upon entry, the guard will inspect your documents and hand you over a number and on what window you will submit your documents. Processing is fast and efficient! Only took us 30 minutes. A representative or one in your group can submit your documents and claim your passports after. No need for personal appearance. UPDATE: As of August 27, 2015, a new application form is to be used and is available in the embassy’s site. Go here in the VISA Announcement section and look for the new VISA Application form. I will strike through some of my tips below as it is not applicable anymore in this new application form. I will try to explain some of the fields in the new form though but most are still self-explanatory. Please do note that there’s no guideline yet on how to fill out this form unlike the old form in page 2. Here is the download link for the .pdf Application form in the embassy’s site. You can then print it and fill it up completely with no erasures! Read the instructions in page 2 carefully before you start filling out the form. Most of them are self-explanatory but let me give you some tips on some items there that are a bit confusing. Print the form and fill it up completely with no erasures! Don’t leave a field/item blank. Put n/a or Not Applicable instead. 1.7. National Identity no. – We Filipinos don’t have this, so just put n/a (Not Applicable). 9.4. Address in Korea / 9.5. Phone No. in Korea – You can put undecided if you haven’t decided yet where to stay in Korea. But for me, I advise you to put a place where you intend to stay like the name of a Hostel in Seoul even though you haven’t booked a reservation yet. There are also Hostels/Hotels in Korea that accepts reservations with no down payment so if ever you get denied, you can just cancel your reservation! Easy as that! In our case, we booked our stay at Zaza Backpacker’s hostel (no down payment) and we wrote down their address/phone no. in these fields. This is just to increase your chances of getting approved. I told you, segurista ako. 9.7. If you have visited more than 5 countries in the last 5 years (as there are only 3 spaces in the application form), write the other details on a separate sheet of paper. If the stamps of these countries are in your old passport, then bring your old passport too and it won’t hurt if you photocopy the stamps and bio page as well. 9.8. If you are travelling with any member of your family, then write it down in this section. I think this is for the embassy to check easily who is sponsoring who in case there is like me and my wife where I am sponsoring our trip in terms of funding. 10.1. Write here the estimated travel cost (in USD) of your whole trip in S. Korea. Be realistic and maybe increase it a little but make sure that what you write here is equal or lesser than the fund in your bank statement or bank certificate. For example, if your fund in your Bank is 50,000 (reflected in the Bank statement), then put around $857 USD (PHP40,000). I subtracted PHP10,000 assuming that the maintaining balance in your account is PHP10,000. 32. Who will pay for the expense for your stay – For the housewife, if you are travelling with your husband and is sponsoring the trip, then put his name then write ‘husband’ e.g. Juan dela Cruz, husband. 10.2 Who will pay for your travel related expenses. Write here the person or company who will pay for the expenses of your entire trip. For Type of Support, you can put Financial support or a particular expense like airfare, accommodation. If you are funding yourself, then put ‘myself’. 34. Accompanying Family – This might sound confusing if you are indeed travelling with your family but don’t be. It states in page 2 to fill this up only If you are a spouse or a child under the age of 20 of a person who holds the visa status of Culture and Art(D-1), Student(D-2), General Training(D-4) through Particular Occupation(E-7). So if neither one of you was issued a S. Korean Visa before, you don’t need to fill this up but just put n/a (Not Applicable). We got our picture taken at Great Image for a more professional look. We paid P370.00 each (P740 total) for 8 pcs of passport size colored picture with white background. Just tell them it’s for a S. Korea VISA application and they know the size for it. There’s free glue in the embassy in case you forgot to paste it in your application form. Make sure your passport is valid for 6 months. 3 months before our VISA application, we went to DFA Megamall to have my wife’s passport renewed to change her surname. Even though my wife’s old passport is valid until 2017, we did this just to make sure that no questions will be asked as to why her maiden name is the one that appears in her passport. Bring your old passports too if there is any. The consul did look at our old passports (maybe skimmed a bit on the stamps) but quickly gave it to us on the day of the application. It should be a clear one but not necessarily colored. Just enough to see the details. If you have this, then bring it. (must include applicant’s position, date hired, compensation, office address, HR landline number(cell-phone number is not allowed), HR e-mail address). Request for a COE with your HR Department at least a week before your VISA Application as this needs to be recent. Clearly mention to them that the details above must appear in the COE. In my case, I got approved even though the HR E-mail address wasn’t on the letterhead and the landline number indicated there is not working anymore! I called our HR about this and said it was OK since they cannot erase any details in the letterhead. In any case, just make sure that the embassy can contact your company in at least one of the details provided. But of course, much better if all are working! Request for additional copies if you are travelling with a dependent. In my case, I requested two. One for me and one for my wife. The details above are part of the new requirements effective March 1, 2015. You request this at your branch of account. I requested mine at BDO where I paid P100 for each certificate (I requested two, one for me and one for my wife). Just tell the staff at at your bank you are requesting such for a Korea VISA Application. If you have several bank accounts, choose the one that you seldom withdraw money. So if you often withdraw money in your payroll account (which I am highly sure you do), don’t choose that. Choose an account that has a steady amount of cash and much advisable if there are more deposits than withdrawals. If you have a BDO Gold and Elite card, then you are not required to submit this. But as you can see, I still requested and submitted this document. This is me in segurista mode. This is part of the new requirements effective March 1, 2015. This is different from the Bank Certificate. It is a list of your transactions with your Bank (credit, debit items) for the past 3 months just like what is shown in your passbook. You also have to request this in your branch of account. I requested mine at BDO and paid P100 for a printed bank statement. If you are travelling with a dependent, then request a copy for each dependent. I advise that the account for the Bank statement must be the same with the account in the Bank Certificate. So if you have a Savings and a Checking/Current account printed in the Bank Certificate, then you also have to request for the printed Bank Statements for both accounts. Be a segurista like me because you’ll never know. You can request this from your HR. You only need to submit a photocopy. I prepared two, one for me and one for my wife. Make sure your TIN number appears in this document. If you don’t have an ITR yet because you are fairly new to your job, then I think you can prepare a letter stating your situation. You can request a certified true copy of your Marriage Certificate in NSO in their e-census website. No need to go personally in their offices. This is the proof that you are married to each other. You only need to submit a photocopy. This is the fun part. The time I saw they have this offer in the announcement section I immediately called BDO if it is possible to upgrade my BDO Classic card to at least a Gold credit card. After some minutes of checking, they happily upgraded it since I have good credit standing and my current credit limit is more than enough to be eligible for a Gold BDO VISA card. Please note though that the new card might take a while to be delivered to you. In my case, it took them a month to deliver the new card! I don’t want to relate what happened anymore but if you are going to apply for a BDO Credit card for this purpose, then it’s much better to apply now so you can adjust whatever time frame you have for the VISA application. According to what I saw in the embassy, you are required to submit two months recent credit card statements with the BDO Gold/Elite VISA card printed. I only have one credit card statement for the BDO Gold since I just upgraded my card so I got a little worried. To be sure, I also printed the credit card statement for the BDO Classic (the month before the new statement). Fortunately, the consul accepted it since she saw the BDO Gold VISA statement and she said that’s sufficient. Latest original credit card account statement and photocopy of the credit card should be submitted. Original credit card should also be presented. For applicants who receive their statement through e-mail, they should visit the bank to acquire the original copy of the statement. They are exempted from submitting Bank Certificate and ITR(Income Tax Return)when applying. Provide a photocopy of your credit card too (front only) and bring the actual credit card. Though I am the only one who has a BDO Gold card, my wife was also granted Multiple Entry since we provided all the documents required especially the NSO Marriage Certificate. Please note that even if you have a BDO Gold/Elite card, that doesn’t mean you are automatically granted a Multiple VISA or even a Single entry VISA! Make sure you still provide all the necessary documents and all the information in the application form is true. You will line up at Window 3 and you will claim your passport 3 days after the application. Korean embassy grants 3 years Multiple entry for BDO Gold cardholders while for BDO Elite cardholders, they grant them 3 to 5 years. The offer is only valid until December 31, 2015. TIP: Arrange your documents in the order listed above. If you are a BDO Gold/Elite cardholder, the guard will insert the credit card statements and credit card photocopy after your application form. No need to submit your itinerary, plane tickets, hotel bookings, tickets to Everland/DMZ, etc. Just submit what is required in the application. Bring a Valid ID (aside from your passport). You need this to enter the Embassy. What is advisable, book a flight then apply for a VISA or apply for a VISA first before booking? If using Philippine Official and Diplomatic Passport. If transiting only and going to the U.S., Canada, Australia, or New Zealand. But must not stay beyond 30 days and with confirmed onward ticket to the 3rd country. If the individual has been to Korea for four (4) times within the past two years with a C2 or C3 visa. Or has been to Korea for more than ten (10) times already. I will bring my own car to go to the embassy. Where can I park? You can park in Tuscany, where the restaurants are at. Parking fee is P40 for the first 4 hours (I think? But I’m sure it’s P40). This is not a tip, but If your application is denied, you have to wait for 6 months to re-apply. So be a segurista like me. So guys, it is advisable to check the Korean Embassy’s site from time to time for new announcements. If I didn’t have a BDO Gold credit card, I might be very nervous about our application even though we have complete documents. And If we were not granted a VISA, I have no one but myself to blame. If you have read this post and you think you are ready for the application, then by all means go for it! We too are very excited on our first South Korean trip this September! Woohoo! He is a programmer by profession but has a soul of a traveler. Aside from his ultimate dream of travelling around the world, he loves to eat, drink, listen to music, talk about aliens and the occasional secret guilty pleasure of singing love songs in videoke. His favorite superpower is to teleport from one place to another. I guess you know why. Hi thank you for this blog, it is very helpful information. Hi! Just want to clarify some things. If one is a BDO Gold cardholder, then he/she is only exempted from submitting ITR and Bank Cert, but not Bank Statement? And, about how long yung submission process? May interview part pa ba? Yes, if an individual is a BDO Gold/Elite cardholder, then submitting an ITR and Bank Certificate is not required but you still need to bring your Bank Statement. Operating hours of the embassy for VISA Application is from 8:30AM to 11:00AM. We went there at 8:00AM and was finished by 9:00AM. It only took 30 minutes waiting time from the start of the operating hours. No more interviews. HTH. Thank you for the reply. I am planning to apply for one this September. Your entry is really informative. No problem Platisha Platt and goodluck in your application! Thank you for your wonderful post. I am granted a multiple entry visa, too! Awesome! Glad to be of help! We just got back from South Korea… stay tuned for heaps of blog posts about our trip! Also, just to be clear, If you are a BDO Cardholder then you will line up at Window 3 and you will claim your passport after 3 working days. Yes that is allowed. The embassy didn’t mention any required attire but it should be taken within the last 6 months – full face, front view against white or off-white background. But it doesn’t hurt if you get your picture taken in photo studios in malls like Great Image. Don’t worry about bringing a coat and tie, they will just edit your picture in Photoshop and place your chosen coat and tie in the pic. Hi, ask ko lang since sa BDO ka din kumuha ng bank cert, paano mo napalagay yung ADB mo for six months and account opening date? Nagrequest kasi kami ng bank cert from BDO and hindi nakaindicate yung dalawang yun nung nakuha na namin siya. We tried to ask if pwede na manual editing and hindi din daw pwede kasi nakatemplate sila (tumawag na din kami sa customer service nila pero ganto din yung explanation). Natatakot kami kasi baka mareject yung documents namin because of this. Thank you. Malapit na din kasi kaming mag-apply. Actually, I just told them that I’m requesting a Bank Cert for application of a S. Korean Visa and they already knew what details to put as they already have a template for it. I’m wondering why the BDO staff in your branch doesn’t know that? Try to visit your branch again and ask if they can re-print the Bank Cert and tell them it’s for a S. Korea Visa application. HTH. Ahh wait sorry, mali pala answer ko. Yes, you can apply on October and if they will give you a multiple entry visa, then you can use it on April. My only concern is that it is very early to apply for a VISA and the embassy might have second thoughts because the documents and funds that you have in October might be different from what will you have by April kasi you’re applying 6 months in advance. Kapag po multiple entry, for BDO Visa gold, good na po yun ng 3 years. 🙂 Hope this clears it up. Thanks for visiting! thanks for the great info, just want to ask since i want to play safe, ung accommodation ko kasi is thru airbnb ok lang ba ung address ng place ung ilagay ko tsaka ung phone number ng host ko, everything is booked na kasi from accommodation to tiket kaso wala pa akong visa, then pag uwi ko pa lang sa pinas ako mag apply since ung bank ko kasi nsa pinas for the requirements, also any idea if enough na ung OEC to replace ITR coz im ofw, hope you can help me on my concerns. Yes that’s ok, you can put their address and phone number. Yes, just don’t forget the COE as that’s the proof that you’re an OFW and you don’t have an ITR. My friend knows someone who is a fresh grad and doesn’t have an ITR but was given a VISA. Just to be safe, you can also write a short letter stating the reason why you don’t have an ITR (OFW). And of course, bring your original and photocopy of valid visa and arrival stamps in OECD countries. Another question, my paid booking is 13 days, should i put 13 days on my intended stay? would 2000$ be enough for my 13 days stay? My flight is already booked on dec 15 and i will apply my visa on dec 1. I dont have stamp yet for oecd country but i have i dubai residence visa, any thoughts on this? Thank you in advance. Yes, put 13 days on your intended stay. Yes, that’s more than enough. Yes that’s ok. Once you arrive, get the necessary documents (bank docs) ASAP. I am a fresh college grad (unemployed). What are the chances na makakakuha ako ng visa? That’s great! It really does help to be a segurista! 😉 Enjoy Seoul! It’s really beautiful there. Hi! Thank you for a very detailed explanation on the visa application. Are you sure that a photocopy of the front AND back of the credit card is required? That is very risky on the part of the cardholders. With the card number, expiration, cardholder name and address and the 3 digits at the back of the card, anyone can use your card for online transactions. I am planning to apply as well. I have prepared the docs but I didnt photocopy the back side of the card. Thanks. That’s a very good observation. As far as I remember, the guard who is checking the documents required us to do so. But if you’re apprehensive, then maybe you can just photocopy the front of your card. So far, nothing bad happened to my account yet hehe… Cheers and goodluck! Thanks for the reply. I’ll bring a photocopy of it then. But to be safe, will block out the last 3 digits at the back of the card. 😀 happy travels to you and your wife. Now, I have a question… If you got a Korean Visa, do you still have to pay for a fee for the Taiwan Visa? What’s the advantage of having a Korean Visa in applying for a Taiwan Visa? Thanks! Hi! Great post you got here. Recently discovered my dad’s AMEX is qualified for the promo. Currently doing my best to apply for a supplementary card now. Anyway my question is, aside from the copy of the credit card statement and the card itself, what should I bring? I read from the embassy’s site that BDO cardholders are exempted from passing an ITR and bank certificate. But I read in the comments I still need to bring a bank statement? Now, If you have a BDO Gold and Elite card, Items 7 (Bank Certificate) and 9 (ITR) are not required to be submitted… But, just to be sure, I also prepared these documents and submitted it to them. There’s nothing to lose if you be a segurista 😉 But if you really can’t submit these documents then it’s ok. Just make sure you bring your credit card statements. They actually require two months of recent statements but I was only able to give them one (one is for a classic BDO card, the other one, the most recent is a BDO Gold statement) but they accepted it. Please do note that this promo is up to Dec. 31, 2015 only. And yes, the form is very important. You won’t be able to apply without that. Ok, found it… but looks like having a Korean Visa doesn’t exempt you for visa-free entry in Taiwan. Good day, pwede po ba mag apply as BDO Gold holder kahit kaka activate lang ng credit card? Thank you! You mean you now have a BDO Classic and you want to have it upgraded to a Gold type? I’m just not so sure about that, I guess the best thing to do is call BDO for such inquiries. I think they will check your credit history if you’re eligible for an upgrade. HTH. Hi, Planning to go there on Spetember but I also want to avail BDO’s promo sana. Okay lang kaya to apply for a visa as early as December this year? And okay lang ba to book the flight after the visa is granted? If yes, any idea ano iindicate ko sa fileds na intended perio of stay and intended date of entry? Yes you can try to get a multiple entry visa using the promo from BDO. Worst case scenario that you will be denied or will be given a single entry visa only, then you can re-apply after 6 months. So that’s in June 2016, but no more promo from BDO… maybe they’ll have a promo from other Banks. Yes, that’s ok. Airline tickets and hotel reservations are not part of the requirements. If you’ll ask me, if I’ll be applying this December, I’ll write down February or March 2016 as intended period of stay even if that’s not the dates you plan. Reason for this is for the consul not to assume that you expect you will be given a multiple entry visa. September is still far away and they might think your financial capabilities will change by then. So to be safe, just put a date that’s near your date of application. HTH. Hi! Im planning to apply for the BDO gold card this week. Habol ako before this month ends. Pde ko bang ipresent ibang bank account sa bank certificate at bank statement? Wla naman kc akong account sa bdo, mag aapply lang ako ng card para sa application ng visa sa korea. Tnx! As per the requirement, see below. Hi! May binayaran po ba kayo nung nag-claim na kayo ng passport? Sa monday ko pa kasi ipapakuha yung sa amin. Gumamit din kami ng BDO gold. Sana ma-approve ng multiple entry. Hello, I just recently opened a savings account po. I’m quite confused about the 6 months ADB. Does it mean po ba na kaylangan more than 6 months or at least 6 months old na yung savings account ko? Even if I’ve got the right amount needed? Thank you po. I’ve already booled a flight na kasi and I can’t help getting nervous. Will appreciate your reply. May I know when is your flight? Yes, as far as I know, your bank account should at least be 6 months old. They imposed this requirement because there are some people who are just borrowing money from relatives/friends to make their bank accounts look ‘Big’ then after they are given a VISA, they will withdraw it and give it back. Much better if you can call the Embassy or your Bank to clarify further. My flight would be on July po. I booked in advance to take advantage of the promotion. I’m not the person who keeps my money in the bank kasi. I’ve sent an email to the embassy already and I hope they reply back. I’ve got a payroll account though which is like a year old but I don’t think it’s advisable to submit it since I’ve got lots of withdrawals and I’ve read in some blogs that they do not advise to use it. Sigh. Just FYI, the BDO promotion has already expired last December 31, 2015. The new promo this year is for BPI credit cards (promo is up to December 15, 2016). You can check it in the announcement section here -> http://embassy_philippines.mofa.go.kr/english/as/embassy_philippines/visa/announcement/index.jsp. If your flight is in July then you might want to take advantage of the promotion of the BPI credit cards (see announcement section for the type of BPI cards). July is still far away, you can just apply for a VISA by June and have a Bank Certificate with 6 months ADB by then. HTH. Hi! My husband and I will travel to SoKor on February. We are going to process our visa this week. Since i am in the province and he’s in Manila, can he submit my application? Or do i need to do it personally? Thanks! The answer is Yes! Just provide all the necessary documents/requirements. Thanks! And also, i have the bpi gold but supplementary card only. Card’s monthly starement is addressed to my mom. Can i still use it? Hmm I’m not sure with that. There was no mention in the Embassy’s VISA announcement page regarding supplementary cards. Better call BPI for clarification. Thanks! One last question. 🙂 Can i still use my passport with my maiden name? Hmm… what we did was we just renewed my wife’s passport to her married name just to make sure and as a proof that she is my dependent. As far as I know, if you’re going to apply with your Maiden name, then you’ll apply as ‘Single’, not ‘Married’. Better call the embassy for more clarifications on this. HTH. Hi! Ask ko lang po if you also submitted a photocopy of your old passport (Including the stamps from all of the countries that you have visited in the last 5 years) together with all the basic requirements like ITR, bank cert, COE etc.? I read somewhere kasi na wag magsubmit na docs na hindi naman nirerequire sa list ng basic requirements for applying. I’m not sure though so I’m quite confused kung okay lang submit ung doc regarding my old passport. I will be renewing my passport prior the visa application. All of my previous travels for the last 5 years including my Korean Visa last year were all posted in my old passport. Definitely bring your old passport especially if you have your Korean VISA there last year. They will look at it briefly. This is useful information! Just a question, did your PHP50,000 travel budget included your wife, or does that mean for your own expenses only? Sorry, just thought about it now… are you asking about the fund for your Bank Certificate (with 6 mos ADB)? If yes, I put more than 50K to my account since my wife is my dependent. So to be sure, I doubled it (even tripled I think). But if it’s just the pocket money in Korea, 50k is more than enough for the two of us. 🙂 Hope this clears it out. 6 months adb po ba kelangan? 3 months lang kasi ung nakalagay sa korean embassy website kaya 3 months lang ung nirequest ko sa bank. pero ung bank account ko has been active since 2012 pa. do u think it will cause problems? – must include applicant’s position, date hired, compensation, office address, HR landline number(cell-phone number is not allowed), HR e-mail address. Bank statement/passbook is for the last 3 months while Bank Certificate ADB is 6 months. tama po ba, ung estimated travel costs po ung nidouble nio? magkano naman po nilagay ng wife nio?or maglalagay pa po ba ung iisponsoran? Hi tanong ko lang po, nabanggit niyo po na kung 5-7 days sa korea dapat ang laman ng account mo ay nasa 50k 6 months before your travel sa kaso ko po kasi nasa 20k palang and sa May na ang alis namin, makakaapekto po kaya ito? Not set in stone naman yun 50k, pero ideally sana para mas mataas ang possibility na ma-approve. Kung sa May ang alis niyo po, pwede pa kayo magdagdag ng kahit paonti onti sa 20k niyo… Iwasan na lang po ang pagwithdraw sa account na yun. Hello..ahmn adik kdrama at runningman ako kaya gusto ko pmunta ng S.Korea….ask ko lang kung pwede ba ipasa ang bank account ko na 2 months pa lang??? When are you planning to go to Korea? For Bank statement, I think pwede pero much better if at least 3 months na. For Bank Certificate, they indicated an Average Daily Balance of 6 months… So dapat at least 6 months na yun account mo para greater chance of getting approved. If you’d ask me, 35k is more than enough for a 5D trip to S.Korea but it doesn’t hurt if you can still add more funds to your account to show in your statement when applying a VISA. No problem! Glad to be of help! Good luck in your application! Hi , Pwede po bang mangaling sa Pinas papuntang Korea pero dito po kami mag apply sa Dubai ng tourist visa.. Since nadun po sa pinas ang mga kids. Hello, we have a ticket for Busan in July dhil promo sayang naman kya grab na.. Family of four kami, me, hubby, student teen college, at son 5yrs old. Gold card holder, w airfare ticket for july4-9, hotel booking okay na rin.. Ask ko lng nung mgaaply ba kyo ni wifey mo sinama mo ba yung plane ticket at hotel booking sa application ninyo? Plan ko kasi i attach? Marami din kmi travel kaya lng Japan nmin is 2009 lampas na sa 5yrs, pero pina copy ko pa rin at plannko rin i attach? Okay kaya ito? at dalhin ko pa rin old passport w japan visa? Beijing 2012, Hk 2007-2012-2015 macau 2011, 2013 singapore, malaysia.. Etc, yrly lumalabas ksi kmi.. Bank cert, Itr pg Gold not required according to their website. . So bank statements need pa? Paano dun sa students 2 anak ko need pa rin yung Bank cert? Plan ko na kumuha ng visa this March 1st week e of last wk feb okay lng ba yun khit july pa flight namin? Ksi pra worry free at okay na lhat.. Bale 4banks nman meron na bank Cert at Bank statements. Ung iti flight at Hotel booking nlng pde ko nb din isama sa application? Please advise! Thank you po sa pgreply! Nope, we didn’t include the plane tickets and our hostel booking. It isn’t required, so you don’t need to. For the past 5 years lang yun sa OECD member countries eh, so even if you attach it, it won’t count anymore. Dalhin mo n ln yun old passport with Japan Visa. Yup bank statement need pa rin, kasi di naman siya kasali sa mga not required to submit kapag gold holder ka. Though may nagmessage sakin na naapprove naman siya without submitting the bank statement basta sinubmit niya yun credit card statement niya… But I wouldn’t advise that to anyone else though, just submit what is required. Since dependents mo sila at gold holder ka, no need to submit Bank Cert po. Automatically sakop mo na sila nun. Masyado po maaga ang March sa pagapply since July pa flight niyo… I suggest kahit around 1st week of May po. HTH! thanks for your reply ngyn ko lang nabasa.. kasi mabuti at me deposit pa e bka di na kayanin ma maintain lahat ung banko maganda amount show money bank cert./ bank dep.. secondly100 each bank cert/ statement so laki na rin gastos dhil lahat un meron ko pra sure visa kami family. Multiple visa naman pg Gold di po ba? so sabi ko bka pwede na March end bka kasi mg expire ung cert/statements e mgkaproblema pg need budget mbawasan pa deposit dun sa iba.. what do u think po! That’s why it’s better to apply at least a month or two months before so that the embassy will see your financial statements as recent and updated. Isipin kasi nila na pag masyado ka maaga nag apply (3 months or so) e madami pa pwede mangyari sa account mo, like mawidraw mo sya for emergency or baka may show money lang dun at wiwidrawhin mo din after ka mabigyan ng VISA. Yup multiple visa ang Gold card.. 3 years po. Try niyo na lang po wag mag submit ng Bank Cert since Gold card holder kayo. Pero kelangan pa rin submit bank statement. HTH. i submitted my korean visa application through a travel agency yesterday. i have 600k adb (bdo bank account) . but salary ko sa itr ko and coe hindi magkamatch.do u think i have a chance to be approved? Ideally, all information about you should match on your documents. I think if the embassy sees that discrepancy then they will call your HR department to verify that information. That’s why it’s important to put the contact number of your HR department in the application form and perhaps in the COE as well. Well, let’s see.. Rest assured that the embassy will verify your information so it’s not an automatic denied visa. Hi. I just updated this blog post as the BDO credit card promotions is extended up to December 31, 2016. Yes, magagamit mo po in your second visa application basta until December 31, 2016.
nagsubmit ako ng visa application through an agency (ADVENTURE INTERNATIONAL TOURS, INC.
(doing business as AMERICAN EXPRESS TRANSNATIONAL) last friday. isa palang stamp ng passport ko (singapore) . i traveled 4 days last january. i have purchased an accomodation via sm global package. sa i.e. youth hostel ako magstay , pero i wasn’t able to submit my accommodation receipt. do you think that would cause problems? tumatawag ba sila sa hostel? cuz I’m not sure kung icoconfirm ng hostel my booking with them.although i can provide a legit receipt incase they ask.and chine check ba nilaannual gross income sa itr ? hindi kasi magkamatch salary ko sa coe, sa salary ko sa itr.my annual gross sa itr (i submitted yr 2014 photocopy)is 178k lang then salary ko sa coe is 32k. ano kaya ang chance na migrant ako ng visa kahit single entry lang.and kelan ba sila tumatawag sa hr?business hours? i asked if may tumawag na from the embassy last friday.wala pa daw. No need to submit your booking receipt of your accommodations. It is not required. Kinakabahan ako magapply. First time ko kasi magtravel outside the country. (1) Okay na po ba ang 50k sa 5 days na stay ko? (2) What if po after ko maapproved ng visa ay gamitin ko yung pera ko sa bank pambili ng round trip ticket at pang book sa hotel madedetect po ba ng embassy na binawasan ko yung 50k na pera at bawiin visa ko? LOL Pasensiya na wala po talaga ko alam pa sa pagtravel outside the country. (3) May bumabagsak po ba sa immigration kahit approved na ang visa? Wala naman required na credit limit basta po at least Gold yun credit card mo. HTH. Hi! What if my Gold BDO card is an extension card from my parents? The account is technically in their name, would I still be considered for multiple entry? Also I am not going with my parents on this trip. Yes, supplementary card holders are eligible for this promo. HTH. denied *** visa ko. may nakapagtry na ba dito magappeal? tumawag sakin *** sm company . i bought a global package kasi for their hallyu tour . they can provide me visa assistance daw. kaso diba 6 months pa ulit reapply in case nadeny? do u think its worth it pa na magpunta ako embassy to appeal to get my visa granted. tourist lang naman talaga *** purpose ko. Sorry to hear that. Yup 6 months to re-apply. I have no idea about appealing your case to the embassy. Maybe others can shed light to this. so nag appeal ako yesterday , ayaw talaga. moving on, I’m going to jakarta na lang on the 27th. may stamp passport ko na korean visa application received and may nakastaple na white paper for my reason of denial( i removed it na ). do u think i will have a hard time passing the IOS. pal flight ko terminal 2 (economy) . solo female traveler ako and second time ko palang to leave the country . my first trip was to singapore last month lang din and i plan to leave again next month to malaysia naman. hindi ba ako maququestion why i leave every month? vacation lang purpose ko and watching concerts. I’ve saved up enough money kasi last year so i want to do more traveling. Well… if it’s not time, then it’s not time… I’m sure you’ll have a good time in Jakarta and Malaysia. Hi, what should we put in “Type of Support” field in the form? I’m paying for my own travel. Tips please. Thanks! When we applied for a VISA last year, we didn’t get to use the new application form yet that has these new fields. But from what I read, they put ‘Financial Support’ in this field. HTH. Hi, since you’re exempted for submitting Bank Certificate and ITR because you’re a BDO gold cardholder did they still asked to submit your bank statement? Yes, I still submitted my Bank statement since it doesn’t state in the promo that the bank statement is exempted. HTH. Why not increase your estimated travel cost? As long as you can show proof that you have the financial capacity, I don’t think you’ll have a problem. It is just an estimate anyways, not the real budget. HTH. Hi Sir, how much did you pay for the multiple entry visa? Last September 2015 I also applied, I also availed the promo for BDO Gold Card holder. I paid 4050 and they granted me a multiple entry visa but valid only for 6 mos….. anyways I applied here in Cebu. Did you go through a Travel Agency? Also, based on their promotion, you should be given at least 3 years multiple entry if you applied with a BDO Gold/Elite card. Do you know the reason why they only gave you 6 months? I applied as an employee, my wife applied as housewife. My wife stated in her application form that I will be sponsoring our trip, so I guess we applied as family. Yes my wife was also given multiple entry visa. So yes, there’s a chance her grandchildren will be given multiple entry too. Sorry but I’ve no idea about company sponsored trips. Is the Bank certificate you mentioned states your personal account or the company’s account? Actually someone messaged me that she was granted multiple entry visa without a bank statement but only presented her BDO Gold card and credit card statement. She was exempted because of the promo, so I’m sure you still have to submit a bank statement if you don’t have these type of cards. Only valid visas in OECD countries are accepted. But yes, no need to submit ITR if you have been to an OECD country in the last 5 years but I think the Visa should be valid. hi, we are planning to submit our visa form this march end because we are so busy in the coming months.. our travel will be in july4 only 5 days in Korea, only for tourism. Do you think it is okay to submit or apply our visa this end March? all the requirement needed are ready including bank cert/ bank statements from 5 banks.. ( dated January 28,Feb 25, March2) iba iba date ksi sobra busy tagal din mgasikaso ng mga requirements so singit singit lng sked to secure these) even though were gold card holder too, like you segurista mode din ako and we have 1 minor and 1 20yrs old daughter w us( she also has her own account maliit lng 32k kasi student pa lng sya). i have another bank plan ko sana ay March 20 pa kumuha ng bank certificate/ statements..
As of March 28, two months old na ung bank certificate na isang bank issued jan28. Three months naman yata from date ng bank cert/ statements pde pa? I usually advice to apply a month before your travel date so that your Bank certs/statements are up to date. In your case, since you are a BDO Gold card holder then I think you have a better chance of having a multiple entry visa since you don’t even need to submit a Bank cert and ITR. Just provide them your credt card statements for the past two months. Then if you want, you can also submit your Bank cert and ITR just to be sure (like me). Regarding the time of application, I suggest you apply at least 2 months before your travel date. Your target application date is beyond 3 months of your travel date. But if you are really busy, then you can try to apply on April 4 (onwards). Got my multiple visa today! yey….! our travel would be in july and filed this April19 our application. When i filed our family visa application i was given a number to Window3 because of my gold card bank statement..
Each one of us have all the attachments needed as per their website requirements. We are couple w teenager student and kinder son. So i got all bank cert& statements. When my number was called and i give my papers to the girl she removed many attachments and said too much papers.. i was in trouble because the original bank cert. & the largest bank deposits we have was also removed by her. We are four in the family and my daughter has only 39k in her own acct so to make sure for approve visa i sponsor her too. The girl only got 1 copy each only (we have 4 bank cert/statements) for the whole family. only if i knew that hindi na san ko gumastos for so many copies from the bank..
our 2 bank certificates dated January 25 pa so April 19 ko filed okay naman.. other bank cert dated March.. my hubby also has his 2316 Itr, and we provided too our small businesess SEC, DTI, etc..
All of us got multiple visa. i fortgot to write Financial to the question what type of support, i filed it blank.. so thank God no effect naman! I think an applicant need to establish his/ her ties to our country and for sure will come back. There must be sufficient funds or deposits. it helps too i think of our passport stamp of travel Yearly, semi yearly travels..
follow up question please… anong number po kya pde toll free tawagan or khit hindi toll free sa korea embassy pra ask ko kung pwede mg apply ng maaga from date of travel.. nka book na kasi kmi at me hotel na rin booked.. thank you! Are you joining them in your trip? I don’t know about retired seniors on how their application goes unless their trip is sponsored by someone (you for example). In this case, it will be a family trip. But sorry, that’s all I know. Try calling the embassy, I’m sure they have a better answer. coe or should I request a new na parehong pareho sa template nila? sobrang nerbyos ko na i dont know how to survive the next 47 days! How much do you think is your ADB for the past 6 months? How many days will you be staying in Korea? You are on the right track that you are slowly adding funds. I think I read somewhere that someone only has 30K in his account and he got approved. So if you have at least 30k then I think that’s a positive note. Thanks so much! We will be staying at Korea for 7 days with 24th our flight. Nakabili na kami ng lahat including the concert tickets. Hindi ako kinakabahan sa friend ko since she was issued a Korean Visa twice before, ako actually ang kinabahan. Im going to use my payroll account so I’m pretty sure na baka mababa siya? I have 50K+ in my bank already we are planning to apply sa last date ng March. 1) My other friend who was supposed to fly this 12th for a concert too got denied ang reason: failure to prove purpose of entry in Korea, according to her hindi daw na-contact yung HR nila. Kinabahan ako kasi since my payroll manager attached his calling card (besides the one in the coe template na directory namin) madalas kasing wala sya sa table niya since busy siya i’m thinking if I could add another contact number? pero i cant obviously tamper our template, should I just attached it? I’m seriously stressed and will be really devasted! 50k is more than enough for 7 days stay. Maintain or increase that amount until your visa application. If the number of your HR is indicated in your COE then I think that’s the first number they’ll call. The HR’s number is sufficient as long as they are always available to pick up the call. Hmm who told you that? As far as I know, as long as you have multiple entry visa, then you can use it anytime within the years they allotted you. Single entry on the other hand is only valid for 3 months. Maybe he told you it is for a single entry visa, not a multiple entry. HTH. That’s great news and I’m glad that my blog helped you in any way. We really liked Nami Island the best but found Petite France our least favorite. We didn’t do much palaces as we only went to Gyeongbokgung Palace. You can also check the Related links highlighted below of that post. Hello, online job freelancer po ako. I pay taxes pero di naman po ganoon kataas ang nasa ITR ko. Supplementary card holder din po ako ng friend ko. May chance po kaya akong magka multiple entry visa sa South Korea? Im worried kasi na baka ideny din ako sa visa kasi mababa lang ang income ko as per itr. Tsaka sabi sa website nila dapat may phone number ang company. Eh online po ang trabaho at sa US ang clients ko. Wala akong maibibigay nga landline number dito para pwede nila iverify ang employment ko. kailangan ko po bang gamitin ang visa soon or ok lang basta pasok po sa 3 year period? may mga posts po kasi na you need to use it within 6 mos..
Basta pasok sa 3 year period oks lang yan. hi kung may bdo gold ,you dont have to submit an itr right ? and also dun sa coe na nasubmit nyo ng wife mo , may i ask if the korean embassy called you to verify ? also may stamp na ba ung passport nyo? ill be applying with my renewed passport kasi so malinis ung passport ko, would that be a hindrance in getting a visa? Yes you don’t have to submit an ITR. i have no idea if they called. Our HR didn’t inform me if they called. Yes yun sakin may stamps na… un kay misis nagrenew rn sya passport with married name kaya no stamps nun nagapply.dinala na ln namin old passport na may stamps dn para sigurado. Hingi sana ako ng help kasi hindi ko alam kung paano ako magprocess..
Wala po akong maipapakitang ITR dahil ang work ko ay online. ESL Tutor po ako. Kung sasabihin ko naman na ang husband ko ay nasa Korea baka naman po isipin nila na hindi na ako babalik sa pinas…at isa pa hindi pa kami kasal ng aking partner. Paano naman po masusuport ang relationship namen? Balak ko po sana isama un daughter ko sa pagtravel. So ayun nga po ang problema ko , wala po akong ITR, kng idedeclare ko nmn na housewife ako, hindi naman kami married nun magsusupport po sa akin. Paano po kaya ito? please help me po. Thanks for visiting and sorry for the late response as we’re traveling. I honestly don’t know the answer to your question as I just base my response to my experience and the requirements of the embassy. I guess if you can’t produce an ITR, then your best bet is to apply for a BDO gold/elite or the BPI card that is stated in the promo so you don’t have to submit an ITR. Hi, I’m planning to get this multiple entry visa kahit wala pa nman akong balak mag Korea as of this moment. I just want to get this just in case may mag aya mag Korea in the near future. My problem is, anong ilalagay ko dun sa section 9.4. Address in Korea / 9.5. Phone No. in Korea and sa section 10.1. the estimated travel cost (in USD)? Pwede ko bang ilagay na “undecided” sa mga section na yan? Thanks for visiting. For 9.4 and 9.5, you can put undecided. For 10.1, please follow my tips on my post above. HTH. Just wang to ask if kailangan din ba i-photocopy ang back ng credit card? Is it safe kasi diba ichecheck ng guard ng embassy ang requirements. Thanks. So sorry for the late response. No need to photocopy the back of the cc. But bring your card just in case. hi.. tanong lang sana ako ksi may parts na nalilito aq konti.. im employed for 3months pa lng and we’re planning on a trip for korea in 2months na together with my mom and bro and mg aapply na sana kami ng Visa next week.. we booked our tickets already.. my questiion is, my Dad will fund our trip.. kanino po bang employment cert, bank cert/statement yung i susubmit ko, sa Dad ko who will fund our trip o yung sa akin? kasi nka indicate din sa Visa application yung employment status q pero 3months palang kasi aq sa work.. thanks.. Hope i’d get a response.. or email me @ harubaozi@mail.com.. Thank you so much. In your case, definitely Dad mo dapat yun mag submit ng bank cert/statement… tapos lagay mo n ln dun sa form mo sa funding details na supported ng Dad mo yun expenses sa trip. Para sure na rin, gawa ka na lang ng letter explaining na bago ka pa lang sa work kaya wala ka pa ITR at small pa funds mo sa bank at si Dad mo mag-sponsor ng expenses. Hello. Additional question lang po. 1. Ill ask my mom to apply for BDO gold pwd po ba ako yung maging supplementary holder? If ganun po, is there a possibility to apply for multiple entry visa even if 3months palang aq sa work if mgka supplemenary card aq? 2. What if ngsubmit kmi ng requirements with BDO pero hndi shoulder ng mama q yung dad and bro ko sa BDO gold but we’re traveling as a family mabibigyan kaya cla ng multiple entry visa? Ksi mom q will apply with her own COE/banks while my dad will cover my bro. 3. Ok lng bah to give bank statement ng BDO gold but we’re not planning to use it kasi we’re not really using credit cards but we will apply for BDO gold just for the sake ng visa nmi kasi malaki gastos nmin sa tickets? What if wlang transactions yung card nmin for two months?? 4. Regarding sa Bang cert and bank statements kasi susundin nmin yung sa inyu na mgpass ng bankcert and itr kahit may Bdo gold, would it be okay if ang bank cert if from another bank and bank statement is yung sa BDO gold?? Or kailangan pareha?? Kasi my mom gamit nya yung Landbank and ipapaapply q xa sa BDO Gold..
5. Regarding my employment kasi 3months pa aq sa work, if ganun wla pa po ba akong ITR?? But i have ipon na ksi 40k as of now sa BDO debit card q, what if ill submit as an employee like submitting COE/bank cert/statement/ITR(ifmeron) and supplementary card if mka apply ako, even if my dad will fund the trip ksi baka ma question ksi aq sa ties q sa country if ilagay q sa application form q na employed pero dads COE/banks nmn ibibigay q?? 2. Sa case kasi namin, I am shouldering the expenses of the trip with my wife. So yes, parang trip as a family kaya nabigyan din siya ng multiple entry visa kahit housewife lang siya. I think pag inindicate mo na ang magsho shoulder ng expenses ay yung bdo gold cardholder, pwede ka din mabigyan and as long as family member ata.. but not really sure kasi nag-base lang din ako sa experience namin. 5. Ok din yan, magbigay ka na rin ng requirements mo as an employee… Wala ka bang previous employer? Kasi kung nag work ka na dati may ITR ka na nun, pero kung as in first job mo… wala pa yan. So I suggest, magbigay ka na rin requirements then indicate mo Dad mo as sponsor ng trip/funding the trip. 6.See my answer sa number 5. Hello.. Very helpful po yung infos here. But i have a question.. Sa case ko po i am employed a week ago palang and we booked tickets for Korea this coming October 2016.. Kasama q po mom, dad and kapatid q.. I planned to apply for a korean visa sa 2nd week September and by that time 3months palang aq sa work. I cant provide ITR pa.. Ano po better gawin?? Sponsored ba yun expenses mo ng parents mo or mag-aapply ka talaga as Employee and submit its requirements? If yes, understandable na wala pang ITR kung first job mo siya… Mag-handa ka na lang po ng letter stating na wala ka pang ITR since first job mo pa lang po. Yep, they should submit their requirements then indicate mo sa form mo sa funding details na sila ang sasagot sa expenses mo. Submit ka na lang din ng mga what is required sa employee except the ITR kasi wala ka pa nun. Kahit bank statement lang siguro para lang sure. I just wanted to ask if you filled up the “Details of Sponsor” for your wife’s application form or just the “Funding Details”? No need to fill up Details of Sponsor. Just tick ‘No’ there. It means someone from Korea (resident) will sponsor your visa. In your case, no one is sponsoring your visa. However, your parents are sponsoring your expenses. So only fill up the ‘Funding Details’. HTH. You can still try and submit the requirements. Just make sure to increase the balance and avoid big withdrawals. I just want to ask if I need to fill up this part (10.2 경비지불자 Who will pay for your travel-related expenses ? (any person including yourself and/or institute) if it will be my own expense?or just put N/A. Thanks for visiting and sorry for the late response. Just put ‘myself’ in that field. btw ask ko lang may nakapagtry na to na magapply 5 months or less after being denied with a renewed passport ? i was denied last feb 16. incomplete kasi documents ko. and isa pa lang tatak ng passport ko. now I’m confident i can pass as complete na documents ko, I’ve been to 3 other countries and i have a bdo titanium (according to korean embassy website,possible na 3-5 years makuha visa if elite cc *** submit ko) .problem ko is if i wait na exact na 6 months, 3rd week of august pa ko pwede magapply. gusto ko sana pumunta korea 3rd week or last week of july. 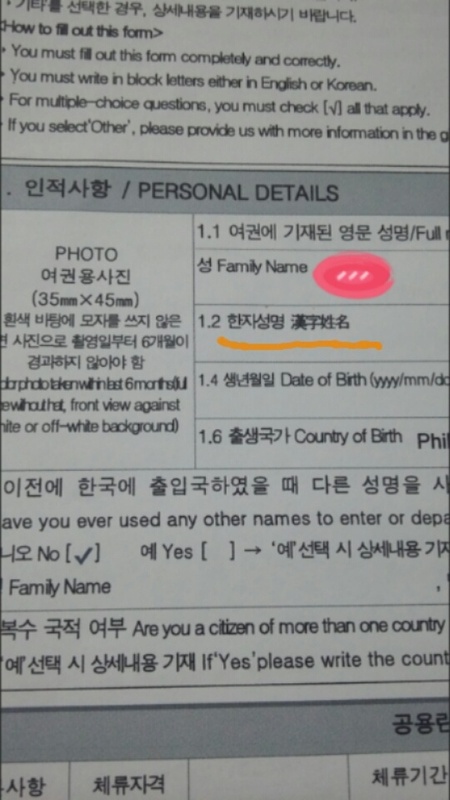 may record ba talaga sila or sa passport lang nila tinitingnan kung nakapagapply and nadeny na ng korean visa before? Better call the embassy for more clarification on this. They stated that you should re-apply 6 months. I have no idea how strict they are with that policy. She did submit her copy of Bank statement but not bank certificate. Also, I have updated the requirements for housewife above (copied from Korea embassy’s website), so you’ll see that the housewife doesn’t need to submit her personal bank statement if she doesn’t have one but she needs to submit the bank statement of her husband. So it’s either you submit your bank statement, or your husband’s. Yes, she indicated that I am funding the trip. Thank you po! Sa 10.1 estimated travel cost po, ano inilagay mo sa form? total for both you and your wife? and how about sa wife na form po? ano inilagay nya sa estimated travel cost? Thank you! And if you dont mind po, sa stay nyo sa korea, magkano po inilagay nyo sa 10.1 estimated travel cost sa form mo and wifey? hehe Thanks! Actually, yun lumang form pa yun naabutan namin. Hindi po yun new form na may estimated travel cost kaya wala po kami nilagay na ganun. I’m travelling to Korea this October (last week) so I plan to apply for the visa in the last week of Sept/1st week of Oct. My problem is that I just opened my savings account last April so by the time I apply for the visa, my account will just be a little more than 5 months old (so it doesn’t reach their requirement w/c is 6 months) Would that be a reason for them to deny my application, if ever? Thanks! Your account is close to 6 months, so I guess that’d be fine. Or to be sure, maybe you can try to apply on the 2nd week of October? Hindi naman ba mabibitin if I apply on the 2nd week then my trip will be on the last week? Do they release the visa at most ng 5 days na? Yes 5 days max released na (3 days for credit card promo and those who have been to OECD countries). I think they’ll call you if they still need something from you. Yes that is fine. Mine’s not complete too but I got approved. The most important is the phone number of your company. They’ll call them if they need more details. Annual gross income is fine. HTH. 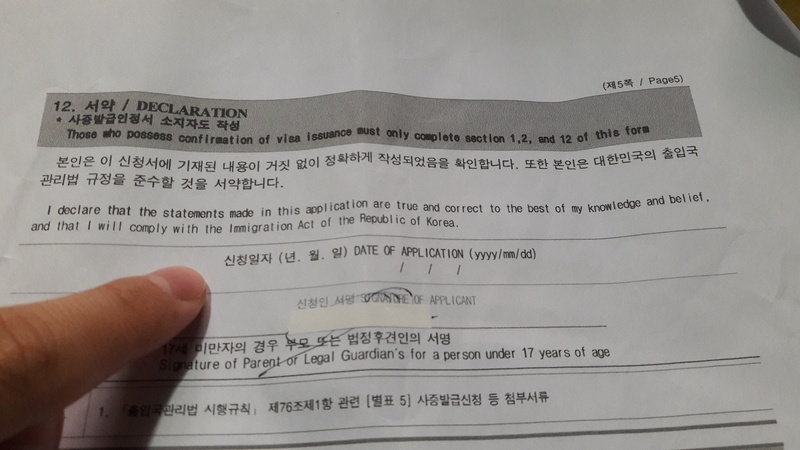 I’m kind of confused in the section 2 (DETAILS OF VISA ISSUANCE CONFIRMATION) of the visa application form because it says “(Section 2 is only for those who possess confirmation of visa issuance issued by the Immigration Office of the Republic of Korea)”. So do we fill that up or is it the embassy who will answer the fields from section 2? thanks! No need to fill that up. Hi, we’re planning to go to Korea spring time next year. Just bought promo tickets and my husband will sponsor the trip since will indicate na housewife lang ako (i’m working from home and no ITR). We will submit two sets of his bank statements and bank certificate and NSO Marriage cert po ba? For his application and mine or 1 lang for both of us? I would suggest to request for 2 copies, one for you and one for your hubby. HTH. When u applied for a multiple visa for 3 years using your bdo gold card, did u pay for it? No, we didn’t pay anything. It’s free. Hi, would you know if embassy accepts bank certificate without ADB? Apparently, my bank doesn’t indicate ADB even if it’s requested for visa application. Much better if you avail a supplementary card to have a high chance of getting a multiple entry visa. If not, then just do the normal application with employee requirements. Just tell the consul you’re applying and traveling as family and your parents has a BDO gold card. HTH. Yes, you can do that as long as you can prove that you are able to support yourself on the trip. HTH. Thank you for the information. My mother-in-law has the gold credit card and she went to australia (oecd member) two years ago. She wants to go to S.Korea with me and my husband. 1.Can we write her as the one who will finance our trip and use her gold card to support our application? Or that’s for husband-wife only? 2. If yes, should my husband still pass his bank certificate and bank statement, or we should use my in-law’s documents? 1) I don’t know how financially able your mother-in-law is but if she can prove that she can shoulder all the expenses of your trip, then I think, yes you can indicate that she’ll fund the trip. 2) I would suggest that you still pass the requirements for employees or businessman then just put your mother-in-law as the one funding the trip. Hi. Your blog is very helpful. Just want to ask about the multiple entry visa since that is what I am targeting (re: BDO / BPI cardholders promo which was extended until December 2016). If you are granted a multiple entry visa then it means you are not required to enter the country within the next 3 months right? You can visit anytime within the validity of your visa even if it’s 6 months or 1 year from the issuance date? I’m just concerned since you have to put your tentative date of visit in your application form. Also, how do you relay to the Embassy that you are applying for the multiple entry visa with the on-going promo? You just have to submit a copy of your atm or credit card? Once you’re inside the embassy, a guard will inspect your documents. Tell him you’re availing the promo and he will assign you to Window 3 for multiple entry. Thanks so much for your replies. Really appreciate it. 🙂 Last question, is the visa in a way transferrable to a new passport? My passport will expire 3rd quarter of next year but I have to apply for the visa before December to avail the BDO/BPI promo. So if I’m granted a multiple entry visa, can the visa be actually transferred to a new passport? It’s not transferrable but you can bring your old passport and show your VISA to the immigration officer. It will still be valid. HTH. Yes that’s correct. You can visit anytime within 3 years (or 5 years). Actually, what I can only suggest is get a tour package from a Travel Agency? Maybe they can help you tour Korea even if you’re unemployed. just wanted to clarify lang po, your wife is not a supplementary card holder right? thanks! Yes she is not a card holder. Hello! My friend and I applied for our visas earlier today. We’re both medical students and are applying for student visas. I just realized now we might have made a big mistake on our application forms. We submitted complete documents. But on the questions where we answered “no” we didn’t put N/A to the succeeding details if our answers were “yes”. I AM BEYOND ANXIOUS RIGHT NOW. Kasi we thought na ticking the no box is enough since logically you should put some answers only if your first answer was yes. 🙁 I don’t know what to do. The consul in Cebu accepted our applications naman and we’re supposed to get it on the 7th. I’m freaking out right now. Hi! The Travel Debugger, ask ko lang pag nag apply ba ako ng multiple Entry for 3 years pwede ko na bang isama yung 2 daughters ko kung magtratravel ako. Hi! Do you still need a Bank Statement if you’re using your BDO Card to apply? Or is it included in the exemption same as the ITR and Bank Certificate? Thanks! Yes, you still need to submit a Bank Statement as it wasn’t stated that it’s part of the exempted requirements. HTH. In my case, i’m only a supplementary cardholder. I have no account on BDO but I have on other banks. Do you think it’s okay if I don’t submit the bank statement anymore? I have both Korean (expired) and Japan visa to back up. But i’m still worried about the Bank Statement. Thank you! The bank statement doesn’t have to be with BDO or BPI (The 2 banks that has a promo here). You can ask it from your main bank. Regarding the visa application form, is it required to print it in A4 paper? Because I read a blog that it needs to be in A4. Thanks! Hi, just a quick question– did you also submit an affidavit of support? Thanks! No, we didn’t submit that document. i visited to Korea two time through single entry now i want to apply multiple can you suggest us after two entry i will able to get multiple visa or after 3 entry i can ??? im applying for BDO Gold promo, ok lang po ba, ilalagay ko ng estimate travel expense ko is 1000usd for 6d2n? yung adb ko 35k, then Credit Limit ng BDO 100k? nde ba nila questionin yung 1000usd? Just a question. My mom is a housewife but she has a BDO gold CC. Can she indicate that she’ll fund for herself (using the CC) while unemployed or would it be better for her to get sponsored by my dad (employed and also a BDO gold CC holder; but he will also sponsor my new grad sibling(CC holder also))? If she’ll get sponsored, she needs the same paperwork as my dad’s, is that right? Would it be possible to get denied kung dalawa ang iso-sponsor? If your dad will truly be the one to sponsor their expenses, then they should put him as the one who’ll fund their expenses. As for the requirements, just follow the steps above — No need for ITR and Bank certificate. Furnish a copy of your dad’s bank statement though. 1. I just finished working in a company last April 22, 2016. I dont have work for almost 3 months (April 23-July 20, 2016). I started my new company last July 21, 2016 up to present. I have an ITR 2015 from my previous company and since end of project my former company gave me also an ITR for 2016 which covered from Jan-Apr 2016. Do I need to submit my 2 ITR or just only the 2015? 2. My husband and I has started opened a joint account last March 2014. My husband has much bigger salary than mine. In the portion who will support your travel can I still put MYSELF only? 3. I went to Japan last March 2007-March 2010 (3 years) as trainee. Do I still have inculde this in my application since it’s been 6 years already? This time i’m single pa.
1) Latest ITR, but bring your 2015 in case they need it. 2) Yes you can, as long as you submit the requirements under self-employed/businessman. 3) Within 5 years as a tourist po, so di na po pwede. Hi travel debugger! I and my mom want to go to Korea on March in time for the Cherry Blossoms. My mom has a BDO Gold CC and she will be sponsoring me (a college student). Since the promo is until Dec 31, 2016 only, we will be applying next week already. Is it advisable that we put March as the intended date of entry or is it better that we put December or January? Kasi baka i-decline yung application namin since matagal pa travel date. Hope you can help me po. Thanks in advance!! More power. Hi! Is sister in law considered as family? THANKS SO MUCH!! I actually have no idea on their rules but I assume that it’s always immediate family (siblings, parents, kids). Why have you asked? Is she sponsoring the trip or the other way around? Thanks for the reply! We’re going to apply with my mom cos my mom has BDO Gold. I was wondering if my sis in law can be “sponsored” by mom para lang makakuha ng multiple visa. Hehe. Thank you so much! She can put your mom as the one who’ll pay for her expenses in the Funding Details section but I’m really not sure if she would be given a multiple visa too (always worth a try). That would mean that your mom should show financial proof that she can support you both, that means, more money in the bank statement and certificate. You can tick ‘Unemployed’. Don’t worry about it as long as your husband can show proof that he is capable in supporting your expenses in S. Korea then you’re all good. My wife is unemployed yet she was given a multiple entry VISA. HTH. Thnk u so much! God bless! May idea po ba kayo kung anong requirements for non working Mom? Nakapunta na po ako ng Seoul, gusto ko sana bumalik with my Mom. Ask ko pag nag apply ba ako ng multiple Visa with my BDO gold pwede din bang iapply ko yung 2 kids and my husband. Each of us will fill up the individual application Visa or ako lng ang mag fifill up ng form at nakalagay na sila sa application form 9.8 for travelling with the family member. Im also planning mag apply ng korean visa using Gold Bdo mastercard. ask ko lang po ilan months po ng statement of account ang ipinasa mo?kc yung skin kakaapply ko plang at kaka approved ng bdo card. and ng pasa kpa din po ba ng bank statement po at bank cert ?kc as per dun sa bdo no need to pass ang bank statement and bank cert. The required is 2 months of credit card statement. Pero sa case ko, ang nadala ko lang nun yun latest ng BDO Gold, at yun latest ko ng BDO Classic since 1 month old pa lang un BDO Gold ko nun. Tinanggap naman ng consul. Hi! Question. im an ofw and i decided to tour korea this november. i brought all my docs even bank cert and statement of my uae bank acct. However, they didnt accept it and informed me na they need the PH ban account which i dont have. Pwede ba joint account namin ng mother ko? Hi guys! Share ko lang. Ofw from UAE. brought all my docs – including bank cert and authenticated bank statement ng bank ko abroad. I dont have a bank here coz I maintaining everything abroad. The lady in Window 2 didnt accept my docs. She asked where I work to which I answered Dxb. She said we need PH bank account. I said I dont have one coz I am living overseas so everything is in UAE. She said no only PH bank accounts. Amf… i was like…duh fudge! I wasted 100 dhs for the bank cert and auth statements tapos di pala tatanggapin. She didnt even bother to tell the applicant if there’s any substitute. Omo! I spoke to a friend and he said to attach my mother’s bank statement and cert and my nso birth cert. I thought that it’s not sufficient since I am not a student but an OFW. So i decided to change my mother’s bdo account from individual to joint account since that is the account to which I transfer my remittances. We went to the bank earlier and they processed it. I will be able to get the bank cert on monday however for the statement of account, since it is a savings account eh passbook lang daw. So photocopy ng passbook pwede? But yung passbook is nakapangalan kay mama. Magiging issue kaya yun? TIA. Ask your bank to print you out 3 months latest balance of your joint bank account. Di lang po yun dapat basta photocopy ng passbook. Ask them to print out a certified true copy. HTH. Hello! I’d just like to ask: I’m employed but if my grandparents will be sponsoring my trip, would I still need to submit my own bank statement/certificate? Or I would just need to submit theirs? Would I also need to submit an ITR? I did this before when I applied for a Taiwanese visa and it might be applicable to you, have your grandparents write an “Affidavit of support” and in that affidavit, they must include their financial information and just attached their bank cert/statements. Also, since you are already working then you have to submit your own requirements as well like COE since those are proof that you have something to return to. One of my travel companion just opened a bank account this month and plan namin mg apply for korean visa on Jan 2017. Pwede na ba gamitin yung account nya for application? No need to purchase another ticket. That’s just the Korean embassy’s suggestion, not a requirement. Hello! I just wanted to ask if you guys had to get medical screenings like chest x-rays, TB tests, etc.? I heard of so many people needing to do them, but I’m not sure of the who/what/why/when/and for what entry/travel requirements they are needed. Thank you so much!! In our case, nope. And we went there just after the mers-cov outbreak. As per Korea embassy’s website, a supplementary BDO Gold credit card is included in the promo. Hello, Sir. Thanks so much. I did not get to attach a copy of my father’s card so I was so nervous. But I finally got my visa and was so surprised when my passport was handed over! I was granted a 5-year-multiple-entry one. Surprised because my card is just gold. Hehe. Now I can’t wait to visit Korea! Thanks again! Wow! That’s so cool! 5 years! Enjoy your trip Erika! opening amount of 200k. Can I add money to it and apply for a visa? Thanks. Can i use more than 2 bank accounts from 2 different banks by the way? Yes it’s extended but the embassy haven’t posted yet with the details. I assume the promo mechanics will be the same as last year i.e. supplementary card holders for BDO are included. Re bank cert, which account has a higher balance and less withdrawals? Base your answer from that question. Regarding my bank account. usually kasi yung current account ko mas active siya cause almost everyday yung deposit ko dun. All of my transactions kasi nandun. But my savings account although I don’t withdraw often but i seldom make transactions dun. Always lng na sa maintaing balance dun. So that is my main concern. Can I call the korean embassy regarding the promos?and as well as my other concerns? I suggest yun savings account na lang as long as yun balance nun at least 50k (the higher the better). Pag kasi madaming transactions na deposit at withdrawal, i-aassume nila na very liquid yun account na yun at anytime pwde mo mapang-bayad lahat yun especially sa checking account na used talaga for payments. Yes, I suggest you call them if you have more questions. Lastly po, yung savings account ko po kasi less than 50k ang balance, can I deposit po ba like 100k? Will it affect my credibility? Or something?like baka mgduda cla? or mas ok na if pa kunti2 lng ako magdeposit?like 10k per day? Ano po sa tingin niyo? Since mga last week po naman ng feb ako mgapply ng visa? And is it true na if individual kang mgapply(im having vacation for 5days lng naman with 2 friends) ng visa mas less yung chance to get approval? Mas better ba na personal mag apply or thru agent? Im from Iloilo pa kasi. Siguro pwede na twice, isang 50k, tapos 50k ulit next deposit. As far as I recall sa BDO, tinanong ako kung gusto ko ipalagay sa kanila kung yun Savings at Current account ilalagay sa bank certificate. So check mo din sa bank mo kung ganun. Kung pwede, ipalagay mo na rin yun checking account mo. I suggest din na mga March ka na mag apply, a month before your flight. Hmm wala naman ako nabalitaan na less chance ang approval pag mag-isa lang mag-apply. Kung from Iloilo ka, meron silang consulate sa Cebu pero I suggest na through agent na lang, malayo rin kasi sayo yun. Thank you talaga.. you’re a big help! I’m really sorry po if I have plenty of questions. And btw, yung current account ko kasi na sa PNB. While my savings na sa BDO( I have my own personal account which I had since elementary years pa and I also have joint account with my brother for business). And I also have other accounts sa ibang bank. Should I submit all of them from different banks? Yes I saw it on the website po na meron na daw sa cebu na consul. And I read somewhere po na meron po na deny dahil through agent sila nag process. And some naman po daw na less ang chances na ma approve dahil solo po mgtravel. And its not my first time to be out of the country po. Should I photocopy the stamps pro from my previous passport po?or just bring the original old passport kasama po ng mga other documents? Sufficient na yun savings account sa BDO as long as sufficient din yun balance mo to prove na you can support your travel to Korea. I have additional questions po. 1. My choices po kasi sa application form about passport info (Diplomatic, Official, Regular, others) I checked the Regular na box, tama po diba? My purpose po is vacation only, what should i check? And if ever po na business trip ung e check ko my additonal requirements ba silang hihilingin? 3.Which do you advice po, in filling up the form. Db lahat should be in block? Pwede bang e type using computer?or dapat hand written talaga? 4. Will a recommendation letter from a korean increase the chances of approval? Or much better walang letter nlng? 5. Meron din po na question na yes or no. If NO po sagot ko kailangan pa bang e fill up ung space ng N/A? “Official use only” should I put N/A to all the spaces that I answered NO?? Or just leave it as is? Who will pay for your travel? MYSELF?? And 700USD enough for 5days?? And did you receive any assistance in completing this form? My answer is NO. Please verify each of my answers if its right. And correct my mistakes or something..
2) Tourism. Kung business trip baka hingan ka pa docs regarding your business agenda. 3) I suggest handwritten with no erasures. 4) Ok lang naman, but still not a guarantee or will it increase your chances unless you’re invited to some occasion like wedding siguro. Consul pa rin magdedecide. 5) Answer it with yes or no only. No need for n/a. Pag chineck mo yun NO, no need to fill up n/a like dun sa 8.1 details of sponsor. No need na… Check mo lang yun tourism/transit. Thank you po. And sa apppication form, dapat A4 size ng paper? Long bond paper po dapat? Hello, I’ve question po ulit. Regarding the Form 2316 na requirements. Kailangan po ba my received stamp ng BIR? Yung binigay kasi ng HR namin wala namang stamp. I read po kasi sa iba na dapat my nka tatak dun. And yung sa birthdate po sa section 1, ano po yung format na ginamit niyo on your application? 1990/08/18 or dapat 1990 AUGUST 18?? And if since solo po akong magapply through travel agency since nsa Iloilo pa ako, do you think mas less po ang chances ma approve if Solo mgtravel? My documents pro is complete and my bank cert, statement po is good naman. I’ve work po and 6 yrs na sa company. But still I’m worried cause hindi po ako personally magpaprocess ng application ko. Bukas ko na pala e submit lahat ng requirements sa agency then sila na bahala mgprocess sa Manila. 1) Wala naman din atang stamp un sakin. Pero mas ok siguro may stamp. Pero ok lang siguro, wala naman nakalagay na dapat may stamp e.
3) Kahit solo ok lang basta maprove mo na kaya mo mag travel dun sa Korea with sufficient funds at babalik ka sa Pinas. 4) Masyado malaki. 1000 USD pwede na. Hi, ask ko lang po sana.. when you first applied for your korean visa po ba my tumawag din po ba sa office niyo na from korean embassy? and nag verify ng mga info? Like if dun tlga ngwork or address ng company etc.? Walang tumawag sa HR namin nun. Ah ganun po ba. Kasi po my tumawag sa office namin kanina. Ng verify lng naman po if dun ako ngwork tska position and address ng company. Ano po kaya yun? My kakilala po ba kayo na same din sa akin? Yep yun iba tumatawag talaga just to verify. Kuya, aware po ba kayo aa website ng korean embassy na http://www.visa.go.kr??? Someone told mo po kaso na I can check my visa application online. And as of today po, application status ko is Approved na ang nkalagay dun. Accurate kya dun? Thanks Sherry for this info and congrats on your visa! Hello! im planning to apply a tourist visa on march because i want to watch a concert there. my problem is im unemployed right now but i have a bf who works at Sokor and he will be the one to finance my trip. what will be the docs that im going to submit?i dont know the requirements for unemployed and im afraid that my application will denied.do you have any tips?thank you! I’m really not confident answering your question regarding your situation. Sorry I can’t help you with this. aww ganun ba. hayyyy lalo akong kinabahan. pero thank you pa din. Please answer my question please…. I’ve been to sokor last april, they issued me a single entry visa. If i apply for another visa what requeirements do i need to give? I dont have an itr, can i pass the requirements without it? Are you employed right now? If yes, are you new to the company? Or are you a freelancer? Hi! I am planning to go to Korea on January 2018. I have a BPI Gold Credit card which entitles me to the BPI and BDO Visa Promo. May I ask kung magkano po yung binayadan nyo for the Visa fee para dun sa 3 years multiple entries? Thanks. i need your insight. thanks!! Hi! We’re going to apply for visa this February. My mom is a housewife. Is it okay if she put her name and my dad’s name sa funding details? Thank you so much! Yes that’s ok. Just tell your mom to bring the financial documents of your dad for proof. I have a follow-up question. My cousin is going to travel with us. What do you think is her estimated travel expenses? My mom is going to be her financer since she’s a student pero we have her mom’s bank statement. We’ll be staying in Korea for almost a week. Thank you and God bless! Thank you so much! My mom is a housewife so unemployed yung iccheck nya sa application form right (Me being super sigurista!)? Also, do you have any idea if ano yung ibig sabihin nila na sa list of requirements- Original and photocopy of OECD countries visa? Yung original attached na sa passport po di ba? THANKS!!! Yes, unemployed or para mas ok siguro, ‘Others’ then put Housewife na lang. She can put around 500-700 USD. Yes photocopy mo na rin. I think hindi pwede since di mo naman pwede magamit credit card nya kapag nasa Korea ka na di ba? Unless you get a supplementary card, ayun pwede mo pakita yun. HTH. How about you apply for the VISA in April before her last day in office? 3 months valid naman yun VISA. If group po kami mag a-apply for korean tourist visa (less than 59 days) for the 1st time, is it possible if 2 out of 3 lang ang pupunta mismo to submit and apply? Out of town pa kasi yung isa po naming kasama e.
Hello! I have been using your blog as a reference since we booked our flights to Korea last year, thank you talaga very informative and detailed. I just want to ask lang, kasi I just got my BDO Gold credit card this week and wala pang statement of account talaga, will it be okay if I’ll just photocopy the letter attached to the credit card when I received it? Also, for the list of countries visited within the last 5 years, if it’s more than 3 countries, should I right it all down on the separate sheet of paper instead or right the first 3 countries and then the rest on the separate sheet? That’s ok, just explain to the consul that your card is new. Just photocopy the front of your card too. You can write down the first 3 countries then the remaining ones in a separate sheet. Thank you so much for your reply! Very timely kasi we will be going to the embassy tomorrow and file our application. Thanks again! I’m planning to go with my boyfriend on September but the thing is his credit record is not really that strong so I’m thinking of putting in the application for visa that I will shoulder his and my expenses since I have a better credit record. My question is, will this diminish his chance of getting a visa since it would seem like he can’t afford to shoulder his own expenses? Is he employed? Does he have at least 30 to 50k in his bank account? If yes, then it might be better if he will declare that he’ll shoulder his own expenses. I think the embassy is ok with this if he is your immediate family or husband but if not, then it might raise some questions. This is just my opinion. You can always ask someone who had the same experience. Goodluck! Yes he’s employed but he has little savings in the bank. His mom died a year ago and afterwards they found out she had a huge debt, so he ended up paying for it and still is paying for it. So he has little savings at the moment. That’s what I’m worried about. I’m really thinking that it would be questionable if we apply it in this manner since we are not yet married. Hi! I would also like to apply Korean visa using my BDO gold credit card but my name stated in my card is my maiden name then my name in my passport is updated to my married name, is it still okay to use my BDO card? When are you going to apply for a VISA? Do you have the time to request for a new card with your married name in the card? Parang wala naman ako naencounter na affidavit of support from the embassy. Kayo na lang siguro ang gumawa. ah cge po. ung sa estimated travel costs po nung wife nio po naglagay pa po ba xa? Actually yun lumang application form pa yun nafillupan namin. Wala pa yun tanong na estimated travel cost dun sa form. Inupdate ko lang yun blog post ko according to the new form. Pero sa brother mo, lagay na din sya ng estimated travel cost. Mga 500 USD pwede na yun. btw may gold cc din po ako. san po makukuha ung bank statement nia? sa bank din po ba or ung SOA na po nia? Hello. Sa Bank nio po kunin mismo yun. Thank you for making this! Very informative! 🙂 I hope I can successfully get my multiple entry visa for our June 2017 trip. Thanks so much for this! God bless you! Thank you Joicie! That’s really nice to hear 🙂 Goodluck to your application. But yes, marriage certificate and birth certificate of your baby is needed. And yes no need for ITR and bank certificate but bank statement is required. Hi! I applied for visa last March, I got denied. Sad 🙁 Laman naman ng bank ko 50,000 and 3 days lang naman nilagay ko na tour sa korea. Di ko alam bakit ako nadeny. Huhu 🙁 Sabi nila becoz im OFW huhu. Just want to know your insights on the following questions I have. 1. I just want to ask, if my mom is Senior Citizen and is not employed. What should I check in the employment Status? Retired, Unemployed or Others (will indicate Housewife)? 2. We are planning to stay in SoKor for 8-10 days, what is the ideal estimated amount I should put in my travel costs? is $1,200 ok? or is it too much? 3. In the funding details, me and my mom have our own bank accounts, and we will not fund each other (no dependents), we will just put “myself” and what will I put in the Type of Support? Savings account? or Financial support? 4. In no. 11 (Assistance with the form), I was the one who filled out the form for my mom, will I put my name on it or not? 5. Lastly, In the personal details section, what will I put in 1.2 because there is no english translation. 1. Retired. She should also get the requirements for the ‘Retired Senior Citizen’ category. 2. Yes that’s fine but also make sure that you have at least twice of that amount in your bank account. 4. Yes put your name in it. 5. No need. I think that’s for Chinese name. Thank you for this. I will submit my requirements today. Hoping and praying for the best. Ano po ang sinubmit na documents ng Mother niyo? Yung mother ko po kasi single mom din, and un-employed. Since separated sila ng Father ko, wala kaming ma-submit na Husband’s COE, bank statement, etc. Possible po ba na requirements ko ang isubmit since ako yung mag fund sa trip namin? hello po.. ano po ibig sabihin ng c39 visa/multiple visa? tas nakalagay 30 days stay? at nakalagay na valid for 3 years..
does it mean na multiple entry eto sa korea tas bawat entry ay maximum stay lang 30days? Yes multiple entry yan and you can stay for 30 days max. Hello can i ask if there is a format for invitation letter from korea? And is it good to ask someone to invite you? Or not? My bf wants to invite me but im afraid i might ne denied because of proof of relationship? I don’t know if there’s a format for the invitation letter. I checked the embassy’s website and there’s no downloadable form whatsoever. I’m not really confident answering you regarding the invite from your bf. Maybe others with the same experience can help you better. Sir, Paano po kung OFW, Ang original plan ko po kasi , pagbakasyon ko direct na ako From Dubai to Korea then, From Korea to Philippines, Possible po ba yun? May embassy ba ng Korea dyan sa Dubai? Baka pwede dyan ka apply? Hi! I was given a multiple visa and used it once already last January. Do I need to present anything more during my next visit, or just the visa will do? And is there like a limit to how many entries we can do? Thank you so much. Just your VISA. I don’t know of any limit per year, but per entry is 30 days. Have you tried calling BDO or going to your branch of account? Mag-ask lang po. I’ll be applying to SK visa this September. Kaso po I only opened a savings account for it this June, so magkaroon ng problem regarding 6 months ADB. Meron din po akong much older account, kaso dollar account po siya. Dun po kasi nilalagay ung educ benefits na narereceive ko dati from US VA, papa is retired USN. E peso earner po ako, so naisip ko po na baka magtaka embassy. I’m not really sure, but If I were in your situation, I’d present both… Get a Bank certificate and bank statement for your peso savings account then just a bank statement on your dollar account. For the Peso account, just explain to them it’s a new account and get the financial documents a week before applying a VISA. 1. From the Korean Embassy website, it says to print the form in A4 size paper. How about the other documents, should they also be printed on a standard paper size? Like, nasa A4 size of paper rin ba lahat ng supporting docs or it doesnt matter? 2. I just want to ask, if my mom is a housewife (single mom), not yet a Senior Citizen, and is not employed. What should I check in the employment Status? Retired, Unemployed or Others (will indicate Housewife)? 3. Me and my mom have our own bank accounts, my mom has a BDO card and I already applied for one so we will fund for each other independently. Considering my mom’s background from #2, In the funding details, we will just put “myself” and support is Financial support. Will it be questionable on my mom’s part? Will the embassy question her capability to fund for herself kasi we will not submit a requirement that she is a housewife nor a senior citizen? 4. For the OECD member countries, I was issued a single entry US visa last year and I was able to travel last year to US. even if my US visa is no longer valid, I can still use it and pass it for OECD member countries right? Since my travel is still within 5 years. is that a correct assumption? Let me try to answer your questions. 1) I suggest to make it the same for all except for the bank statements/certificate. Just accept what the bank will give you. 3) If you put housewife, In the funding details you should either put yourself or your father. In that case, you should be able to present your documents or your father’s documents to the consul. Requirements for housewife are indicated in this post. For #3 question, since we’ll put housewife, so that means she cannot put herself in the funding details, even if she has her own bank account, can submit bank certificate and also has BDO bank statement ready to be submitted? and our only choice is to make it appear like she’s my dependent instead of showing the embassy na we can fund ourselves independently? By August or September naman meron ka ng SOA nun kahit isa. Yes, you still need to present the bank statement. Yes, there is a ‘BDO’ written in the remarks in our visa. Just not sure why yours has none. Maybe they don’t put it anymore? Maybe. I just got my visa this week & I’ve seen from several other bloggers who used either their bdo/bpi card that they have either bpi/bdo in their remarks. I just thought that maybe you guys may have just altered it for blogging purposes. Anyway, thanks for the reply. Hmm di siya magfo-fall sa Housewife category since di niyo naman mapepresent ang docs nun Father mo… I think baka pwedeng bukod sa Financial docs ng mom mo, ipepresent mo din financial docs mo tapos lalagay mo dun sa form niya na ikaw magiisponsor ng travel niya (funding details). Try niyo na lang… as a family naman ang trip niyo. hi travel debugger. i am an OFW and i am curious about the ITR since i dont have one, will i still need it or i got a pass on this one? I think there’s no need. Just write a letter of explanation of no ITR stating you’re an OFW. Hi! I will be applying for Korean visa this month. My travel will be for 9 days, however I will declare only 3 days to match the amount of money in my bank. I will be sponsored by my friend there but I will not also declare it so there will be a better chance of being approved. Do you think this will increase my chance of getting approved? Anyway I am a government employee and I have completed all the documents needed except about the bank since I want to get it a week prior to my application. Thank you! Approval of visa will always boil down to the documents you’ll submit and your socio-economic ties with the Philippines. Your strategy is good but make sure your documents can still prove you can travel there and you’ll come back to the Philippines. Hi, My name is DAVE BROWN and i just want to share my experience with everyone. I have being hearing about this blank ATM card for a while and i never really paid any interest to it because of my doubts. Until one day i discovered a hacking guy called CARL . he is really good at what he is doing. Back to the point, I inquired about The Blank ATM Card. If it works or even Exist. They told me Yes and that its a card programmed for om money withdraws without being noticed and can also be used for free online purchases of any kind. This was shocking and i still had my doubts. Then i gave it a try and asked for the card and agreed to their terms and conditions.. Four days later I received my card and tried with the closest ATM machine close to me, to my greatest surprise It worked like magic. I was able to withdraw up to $3000 daily. ATM has really change my life. If you want to contact them, Here is the email address (atmcardservice41@gmail.com). Hi po! I’m working here in Dubai and planning na mag VL sa Korea din. Though hindi pa ako nakakapunta sa ibang countries so ang tatak lang ng passport ko is sa Dubai lang. Malaki po ba ang chance na ma deny ang visa application ko? Thank you. Try mo na lang po dyan sa Dubai mag apply ng VISA. Mas ok kung dyan ka na apply. Pero sa question mo, meron naman nabibigyan ng VISA kahit wala pang travel outside the country. It all depends sa profile mo rin. Hi! i just want to ask kung pwede ko po ba ipasa yung sa bdo credit card ng dad ko para po hindi na magbigay ng itr? May business po kasi kami at sakin nakapangalan kasi senior citizen na po sila. wala po akong credit card at student palang po ako. Hmm hindi po pwede unless may supplementary card ka or sasama Father mo sa trip at dedeclare nya na sya mag fa fund ng travel expenses niyo. Pag ganun may chance makakuha ng multiple entry. Thank you po for the fast response! Pero if ever pano po kayo nakakuha ng statement of account para sa credit card? Same lang po ba yun sa monthly billing statement? Tska automatic po ba nagpapadala ang BDO ng physical copy po? Kasi chinceck ko po yung website tapos kailangan pa mag-apply for monthly billing statement tapos i-approve pa po ata nila pero wala naman tumawag na BDO samin..
Yun rule kasi nila ngayon dapat physical copy. Dati kasi kahit print out lang ng statement pwede na.. so hingi ka na lang sa BDO ng physical copy… pero tingin ko naman pwede siguro kahit un electronic statement lang print mo na lang sa colored printer pero syempre mas ok un mismong pinapadala nila. Hi! I just want to ask if the requirements for the housewife can be apply too for husband who does’nt have work? My husband resigned to his previous job and we are planning to go to Sokor before he starts looking for a job. I’m presently employed at a bank for 12 years already and I’ll be the one to support our trip, considering our humble savings in our joint bank account and my work will that suffice? Hope you can help me in my predicament. Thank you.